"ComfortGeni is the most advanced tool available for moving warmth." ComfortGeni specializes in residential fan products designed specifically to efficiently move air from room-to-room and level-to-level increasing the area your wood or pellet stove heats. 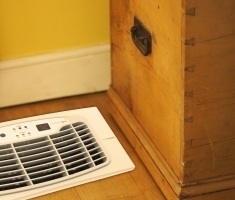 ComfortGeni operates at a safe, low voltage and includes an automatic on/off temperature sensor for greater energy efficiency than standard fans. Easy installation for any DIY homeowner and simple setting adjustments, regardless of location, via remote control, provide unmatched convenience.